Patio umbrellas help you enjoy your outdoor space by shielding you from the scorching sun. However, you will need to consider several factors before buying an umbrella to liven up your outdoor space. Aside from color options, you will need to consider the canopy size, material, and style. 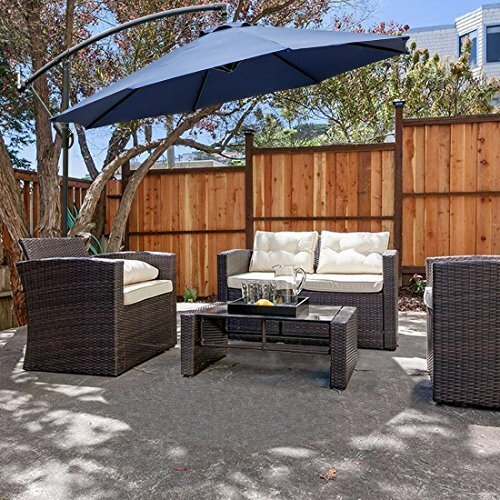 This guide will facilitate the purchasing process by pointing out the key features to look for when searching for the best patio umbrella. To begin your search for a patio umbrella, you will first need to know whether it will accommodate your space. Umbrella canopies range in diameter from 6′ to 14′ and have a height of up to 10′. To make sure your umbrella will fit the available space, allow two feet on each side of the table or area you wish to shade. For example, if you want to cover a 6′ table, you will need a 10′ diameter canopy. As far as height goes, 7′ is suitable for most spaces and leaves enough clearance for individuals over 6′ tall. In addition to the protection factor, the type of material you choose will determine how easy it is to maintain and how long an umbrella will last. The best fabrics are windproof, waterproof, and UV resistant. Also, solution-dyed fabrics keep the color from fading. Aside from fabric options, you’ll need to consider the type of material of the pole and frame. Powder-coated frames offer the best protection against the elements that cause rust and corrosion. Aluminum and steel structures provide excellent support and durability. A patio umbrella needs a weighted base to remain stable. Always pay attention to the manufacturer’s weight recommendations to keep the wind from tipping over your umbrella. Naturally, you’ll want the best patio umbrella that not only provides shade, but also enhances your outdoor decor. Styles include market types, cantilevers, tilting and rotating designs. Market Style: These umbrellas can stand alone or fit inside the center ring of a patio table. Cantilever: This model is sturdy and designed to withstand harsh weather conditions. Tilting: The best tilting patio umbrella allows you to change the angle of the canopy as the sun moves. Rotating: Rotating umbrellas offer flexibility to cover a wide area with shade without rearranging the furniture. Now that you know what to look for, you can use this information to find the best patio umbrella for your outdoor space. Here are the top picks. The Patio Watcher comes in six vivid colors to match your outdoor furniture perfectly. At 9′ wide and 7′ high, it offers nearly the same coverage as pricier models. With UPF 50 and UV resistant fabric, you will enjoy sun-filled days with up to 90 percent protection from damaging UV rays. The polyester fabric also resists water, so if it happens to rain, you won’t have to worry about water leaking through the material. 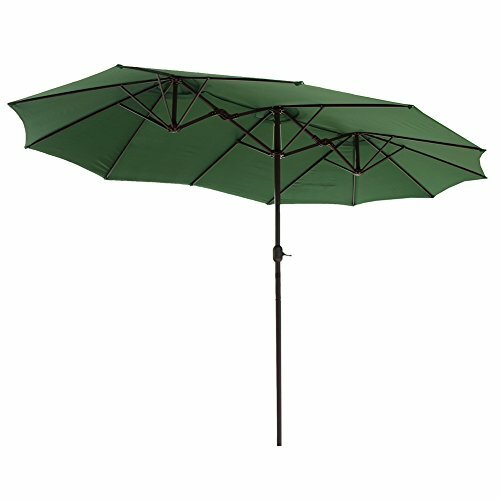 A sturdy powder-coated aluminum frame, 1.5″ pipe, and eight steel ribs keep the umbrella in place during a breeze. A light crank opens and closes the canopy while a simple button tilts it up to 45 degrees, giving you total control over the areas you want to shade. The umbrella is easy to put up and take down and has a Velcro tab to keep it closed when not in use. Unfortunately, the canopy and frame show signs of wear if the unit is left outdoors all year. 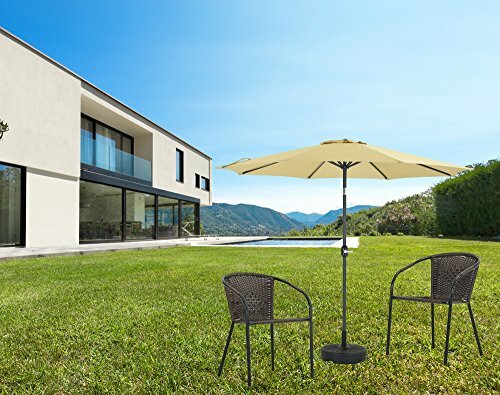 The Cantilever Offset Umbrella offers a modern vibe with its beige canopy set against black powder-coated ribs. Thanks to its 360-degree rotating design, you can direct the shade wherever you need to beat the heat. And given that the canopy extends away from the frame, you will enjoy the flexibility of shading a table or a group of chairs. The high-quality polyester material is waterproof, resists fading, and blocks ultraviolet rays, giving you many years of use. A smooth operating lever lets you lift and lower the shade with ease. Eight reinforced ribs and tight stitching keep the canopy on the frame. However, the cross steel base needs weights to keep the wind from toppling the umbrella. The Abba Patio Umbrella is one of the most durable canopies on the market. Solution-dyed polyester fabric offers colorfast protection for up to 1,000 hours. It’s also waterproof and easy to clean. A wind flap prevents it from falling on breezy days and protects the top of the pole when the canopy is closed. The canopy supplies ample shade to cover up to six people around a 54″ table. Plus, you can tilt it to your desired angle as the sun moves. An antique bronze, powder-coated frame adds style while resisting rust and corrosion. A wind vent prevents the unit from collapsing during wind gusts and steel arms provide additional support to keep it from buckling. You can purchase a matching base to let it stand on its own or put it through the center ring of a patio table. However, the cranking arm does not move as quickly as other market umbrellas at the same price point. This rectangular shade is one of the most stylish units on the market. It is paired with a diamond-shape solar-powered panel on the canopy’s roof. The solar-powered lights last between 9 to 12 hours, providing the perfect ambiance for a romantic dinner on the patio or nighttime party by the pool. During the day, you can tilt the umbrella in the direction of the sun to keep the rays off your face. Besides 26 LED lights, the outdoor shade comes with rechargeable batteries for the solar panel and a power switch. Sturdy hinges allow the umbrella to open and close with little effort. 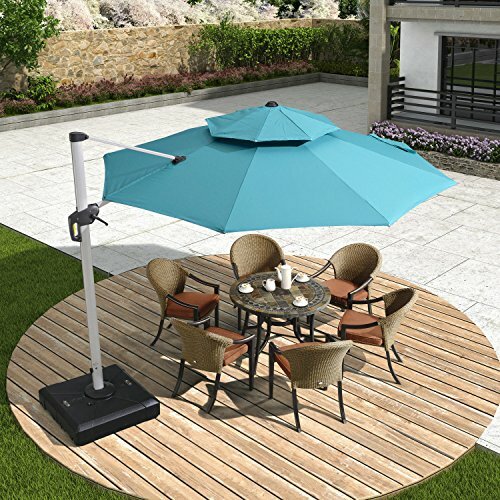 A dual-purpose wind vent provides cool-air under the solar panel and prevents the umbrella from tipping over. Plus, the frame is made of solid steel. The solar-powered umbrella is fade-resistant, scratch-resistant and waterproof. At only 12 pounds, it’s lightweight and easy to move from the deck to the pool area. Unfortunately, it is shorter than most patio umbrellas. Attractive Feature(s): Long-lasting Sunbrella fabric, crank lift suitable for counter height tables. Drawbacks: Tilt button is near the top of the pole and may be difficult to reach. This premium-grade umbrella is designed for residential and commercial settings. Compared to other models, it is one of the few umbrellas made with Sunbrella fabric, which allows you to leave it outdoors all year. Eight aluminum ribs, a 1-1/2 inch powder-coated bronze pole, and nylon fittings contribute to its strength and durability. It works well with low and counter height tables. With an integrated lever and push-button controls, you can raise, lower, and adjust the canopy throughout the day as the sun rises and sets. The umbrella fits most standard bases and requires at least 50 pounds of weight to keep it from flipping with a gust of wind. Unfortunately, the Sunbrealla fabric is only available in heather beige. 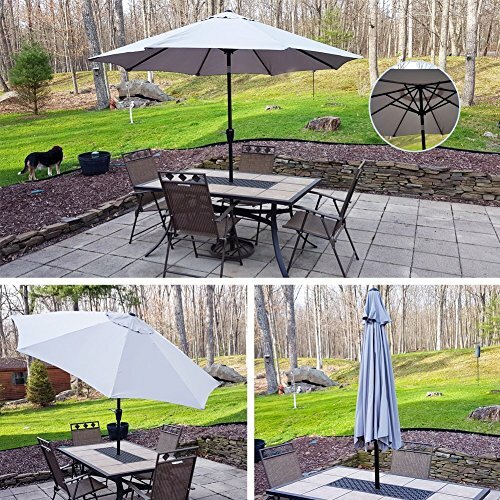 Blissun’s aluminum patio umbrella will enhance any balcony or patio. At 9′ wide, it provides a generous amount of protection from the harsh sun. It ranks high with pricier models and has a high-quality look and feel. Most notably it features eight aluminum ribs and durable waterproof and UV-resistant fabric. 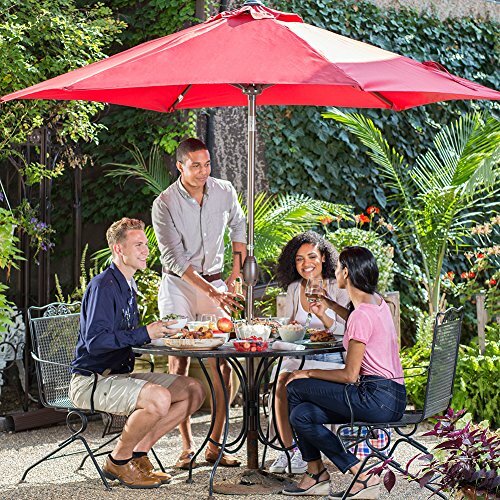 An effortless crank system allows you to enjoy spontaneous gatherings and the dura-tilt option lets you angle the canopy in any direction to provide perfect shade over tables and chairs. The unit is lightweight, but sturdy and can withstand sudden blasts of wind. 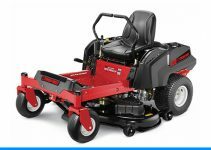 You can easily move it from the patio to the lawn to give you shade will you tend to the garden or yard or put it near the shed while taking care of woodwork. Unfortunately, it’s only available in two colors: grey and dark green. 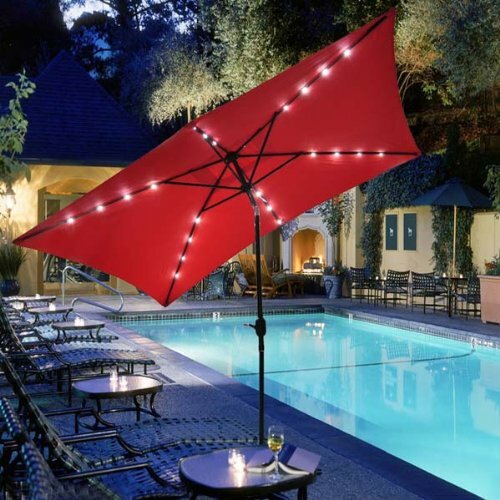 The Le Papillon is a super-sized umbrella, offering almost 15-feet of shade, making it a solid choice for residential or commercial locations. It stands almost 9′ high, so tall people can stand beneath it comfortably without ducking or hitting their heads. It is perfect for long tables, pool areas, backyards, and restaurant patios. The double-sided umbrella offers UV protection up to 98 percent and is resistant to mold, mildew, rust, and corrosion. With 12 sturdy steel ribs and two wind vents, this attractive umbrella provides stability and helps reduce wind pressure. 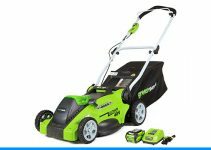 Sturdy construction and tool-free installation make it ideal for backyard barbecues and other outdoor events. Regrettably, the umbrella is a bit top heavy and requires a 55 lb base. It’s also too big for small spaces and does not have a tilting option. If a hassle-free setup is your primary concern, the Cantilever Offset Umbrella by Le Papillon is a smart choice. The attractive 10-foot canopy features a unique lift system that opens and extends with a simple upward motion. With a 360-degree rotating hub, you’ll get more coverage than market umbrellas. 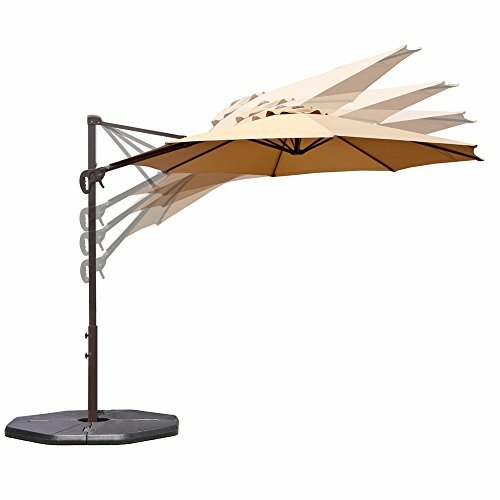 As with all Le Papillon brand patio umbrellas, the canopy blocks up to 98 percent of the sun’s harsh rays. It is supported by an aluminum pole with eight ribs. This model comes with a cross base, but still requires weights to keep it in place. The umbrella is heavy, so it is best to decide where to place it before setup. 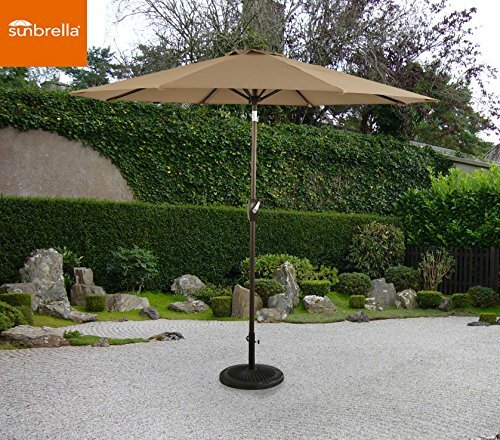 The Abba Offset Cantilever Umbrella has a convenient cranking system and an 11-foot shade diameter. It also features five vertical tilt positions to make sure you remain cool at all times. Since the canopy stands away from the frame, you can create the ideal shade coverage for conversations, lounging, or dining in residential and commercial environments. Besides an air vent, the umbrella features eight steel ribs to provide stability. 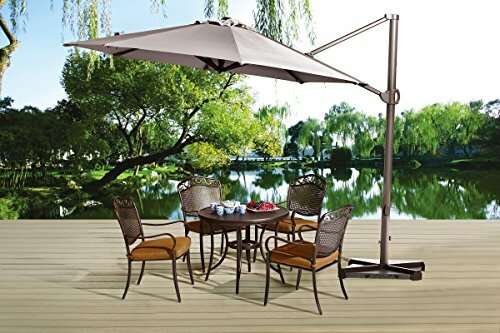 This patio umbrella is among the heaviest units available. Nonetheless, it requires four-30 lb concrete weights to secure its position, particularly on windy days. This double-top canopy shares a lot of similarities with the Abba Offset Cantilever, such as 11′ diameter coverage. However, it comes with a higher price tag. 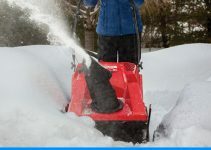 Still, you get superior features such as a unique handle design and crank system that allows you to adjust the height and angle six different ways. The canopy is made of high-quality, fade-resistant, UV resistant, waterproof fabric. Plus, the pole is spray painted with an anti-oxidation treatment for longevity. It comes packaged with a storage cover and a cross-shaped base. However, the unit will tip over if it is not secured with the proper weight.